Les filles du calvaire gallery is pleased to present the first solo show of Noémie Goudal, a young french photographer, and laureate of the HSBC prize for Photography in 2013, at the gallery. If Noémie Goudal's work seems to offer multiple ways in which it can be approached, this is because it maintains ambiguous connections with reality, relationships that are revealed to be the very essence of her universe-for it is indeed a universe that we can speak of with regard to her work. This universe spans from her selection of sites for her photographs to the installation of large format images in unusual places. 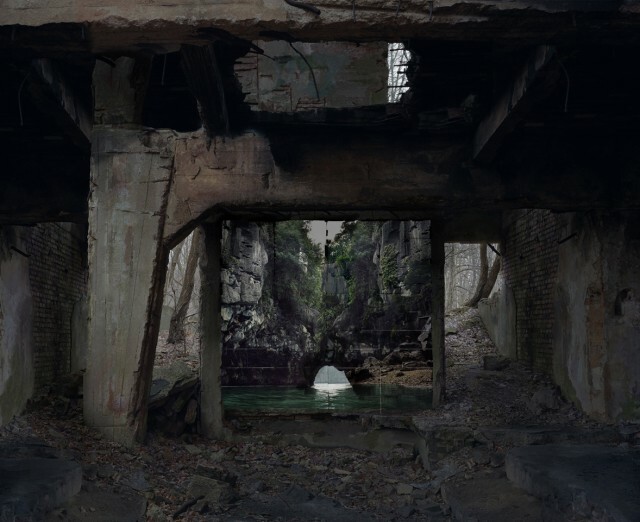 Many of her photographs show enigmatic constructions, modern ruins for which concrete seems to be the favoured material, that of a dessicated and soulless civilisation whose utopias have drowned in who knows what lake. It is nature that has taken over; we will return to this later. By working on this kind of 20th century archaeology, its dreams of greatness or of conquests with a totalitarian or industrial vision, Noémie Goudal's work fits within the tradition of artists of the same generation, such as Geert Goiris and Guillaume Lemarchal *, with close ties to photography, or Cyprien Gaillard who, like Goudal, uses several media. Through their implacable images, they also examine the vestiges and aberrations of certain aspects of our civilisation such as it has developed in the 20th century. For Noémie Goudal, the series Haven Her Body Was evokes a world on the road to ruin, a world that rebuilds itself differently. She questions the fragility and the power of nature and the relation it maintains with man: ruins were a departure point; then it is nature that takes over human constructions. Thus the latter have been destroyed by violent natural elements, such as hurricanes or the force of the sea. This series of images with a strong architectural connotation could suffice in itself and spread out in an autarchic way, in a kind of abstract monumentality, existing only because of the photographer's gaze, at that instant when reality joins fiction. Little by little, however, Noémie Goudal makes these elements of modern ruins slide towards equally singular vegetal apparitions, they too emerging from the aquatic surface. One and the other can be perceived as observatories dominating a landscape and structuring it like promontories. Although it goes without saying that this observatory term infers the notion of point of view, the photographer seizes hold of it in a quite personal way, by reviving the practice of stereoscopic photography. "I created stereoscopes with images that I composed digitally, not with a typical stereoscopic camera. Hence the 3D effect appears on only one part of the image." Superposing images, fragmenting points of view and developing new perspectives are central to Noémie Goudal's concerns. Her first series, Les Amants (The Lovers), constituted a kind of metaphor for the conflicting relationships between nature and mankind, where the territory of one is given a pounding by the other. At the beginning of this work, Goudal imagined "a desolate territory, where mankind had come, then left, leaving behind the vestiges of its history". For her, "nature as well as these vestiges would together create a new landscape here." The premises of her work thus laid down, the photographer became interested in places with atypical landscape elements, such as islands and caves. In history as in legends, these places are imbued with a certain dramaturgy, or at least are propitious to reconstructions or particular mises en scenes. These secluded and isolated landscapes have always attracted human beings, either because of an interest in the discovery of unknown and mysterious lands, or because of the feelings of shelter and protection that they provoke. Noémie Goudal says nothing other when, invoking these places that also interest her, she describes them as "heterotopias, created between a geo graphic reality and a part of human imagination." The counterpart of these natural spaces, relatively difficult to access, consists of disused and deserted industrial places, where we find this atmosphere of sites nearing the end of their lives. She is not content with photographing them as though it were necessary to protect their memory, but re-appropriates them like 'décor'. Inside them, she installs her photographs of similar places, enlarged to the size of the site she is filling, to interfere with the latter and to create a new imaginary world. "In the construction of my photos, I'm interested in creating a new perspective within the context of the image, by blurring the boundaries between reality and fiction, the real and the invented. I've asked myself how it might be possible to enter the perspective of an image by offering a half-real, half-artificial landscape." Hence, there is once again the question of the superposing of shots and the fragmentations of spaces to create new perceptions, by playing with the perspectives of the host site (caves, disused factories, ships lying high and dry, deserted barns) and the traces left by its history. Sites initially without a perspective find themselves extended and transformed into another natural or industrial 'décor', thanks to this superposing of images. There is nevertheless no confusion possible between the envelope and its contents, because the 'imported' images are themselves composed of fragments (here we are again) of the same image decomposed and printed on paper sheets suspended in the new space, squatting it in a way. These spaces that have come out of nowhere are not accessible to the public, the perspective and harmony of the mise en scène can only be glimpsed from a unique and intangible point of view, the one that the photographer reserves for herself. The places taken over by Noémie Goudal transform into a medium for her visual installations, which, paradoxically, reveal the existence of the former by overshadowing them. She is not content with merely upsetting the perspectives of her images, she also disturbs the spaces that she takes over, whose perception she modifies so as to develop a new territory. *Guillaume Lemarchal was the recipient of the 2008 Prix HSBC, with his work on Les Paysages de l'après (Landscapes,afterwards).